Gold fell to $1234 on Friday, its lowest level since July 2017, and below its 11-month cycle low of December 2017 after the greenback's uptrend continued despite a less than expected increase in the US consumer prices. On another note, the costs of US President Trump's earlier taxes on US consumers are starting to come through. Some data showed an increase in prices for some products by 13% so we will have to wait and see how it affects the Dollar Index. Gold bounced back from its lows with the help of oversold conditions breaking the purple trend line to the upside as we can see on the chart. 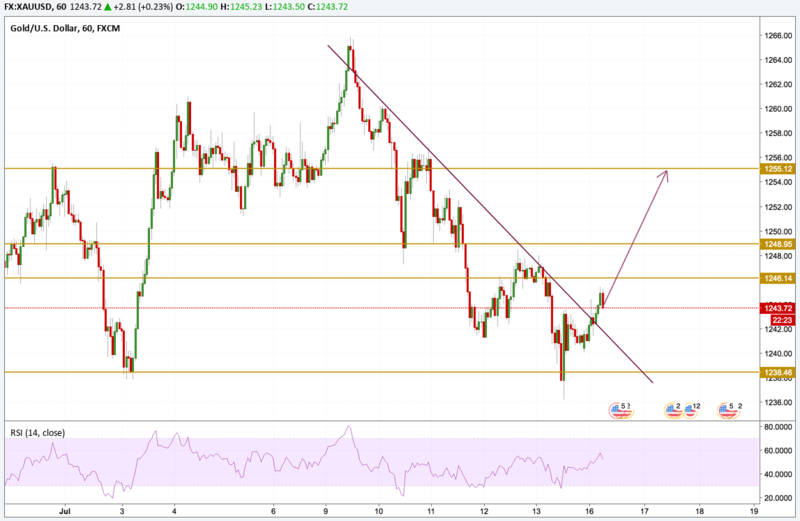 We are looking to test the 1246$ resistance level and eventually the $1255 major resistance level on the longer run. We expect a small pullback for the price before we continue the uptrend.